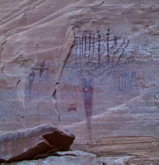 BUCKHORN WASH PICTOGRAPH PHOTO GALLERY. Buckhorn Wash Pictograph Site features Barrier Canyon style rock art. There is also some petroglyph panels in the wash. Click on the first thumbnail to see larger image. Use controls at bottom of each large image to start slide show or go through manually with arrow keys.